Professor Jean Krasno has devoted her career to studying and teaching the history of the United Nations and it’s peacekeeping practices at the City University of New York and Yale University. Since completing a 6-year effort to organize and publish the papers of former Secretary-General Kofi Annan, she has been in the process of transforming the five-volume print edition into a searchable online database—Professor Krasno intends to do the same with former Secretary-General Ban Ki-moon’s papers. She recently sat down with PASS to discuss this new initiative and her evolving philosophy of institutional memory. Could you share a little bit about your career and how you first got involved with the archival work you do now? My first involvement with the UN was while I was working on my PhD at the City University of New York. Although I wasn’t formally studying the UN at the time, I became completely enthralled in the subject and I quickly found myself working on an oral history project about UN peace operations with one of my colleagues, Jim Sutterlin. Jim was also a speechwriter for Javier Pérez de Cuéllar, a former Secretary-General, and they asked me to help them write his memoirs. As part of my research, I went through Pérez de Cuéllar’s papers, which were stored in these random filing cabinets up on the forgotten 39th floor of the UN. These papers had basically been abandoned, and not respectfully stored. I realized that the collecting and handling of the Secretary-General papers was very haphazard, so, while Kofi Annan was Secretary-General, I wrote him a letter to ask if I could organize his papers and publish them—and he said yes! It has been such an enjoyable process working with him, and the Annan papers were published in 2012. Almost a year and a half ago, Ban Ki-moon’s office contacted me to ask if I would organize his papers for publication as well, and now here we are. What kind of knowledge can the papers of a Secretary-General impart? The stewardship and study of these papers gives us access to a decision-making process that usually takes place behind closed doors. Each page of the Secretary-General papers reveals specific steps taken by SG Kofi Annan before he made an official policy decision—who he corresponded with, meetings he attended, and other details. We comprehensively compiled everything in the public domain—speeches, press conferences, and hard to find information—and even obtained newly declassified papers including internal documents between the Secretary-General and, for example, the Office of Legal Affairs or the Department of Political Affairs. When I asked Secretary-General Kofi Annan for access to the declassified papers, he was very forthcoming, but the papers still had to be officially declassified for us. The process was thorough and lengthy—the UN even had to hire a special declassification officer—but it was worth the wait. The five-volume print edition of the Secretary-General’s papers includes countless transcribed documents, but with our current effort to publish Kofi Annan’s papers online, researchers can also see unique visual details. For example, SG Kofi Annan’s UN Secretary-General’s letterhead and handwritten notes are visible. These additional notes show how engaged he was with everybody within the Secretariat, and the kinds of questions that he had. In one instance, he wanted to set up an office for mediation because mediation is such an important part of the UN’s role, particularly for the Secretary-General; the documents show that his first step was to acquire a formal definition of mediation before he moved forward with establishing a set of official guidelines for mediators. It sounds like there’s a great deal of archival work to be done, but there are also some curatorial choices. So can you talk a bit about balancing those two responsibilities? One of my goals was to maintain an institutional memory for the UN because everything that’s going on in the world comes through the Secretary-General’s office. You might assume that much of this material has already been digitally captured through email or other sources, but it hasn’t. SG Ban Ki-moon wanted to start using email more often when he became Secretary-General, but quickly realized the volume of that direct communication simply wouldn’t be manageable. The use of paper reports and summaries is a crucial buffer that allows the Secretary-General to stay focused. They also offer a much clearer record than a million little emails, which is why it’s so important for people to see them. And to be clear, the volume of physical papers is staggering—we needed to make them manageable. We received 900,000 documents. I read all of them, and then chose what I thought were the most important themes. One important group of papers were those regarding the Millennium Development Goals developed by SG Kofi Annan; the MDGs have had an extremely important role in shaping our world, and I wanted to capture the earliest ideas that led to their development. We were also able to document the evolution of SG Kofi Annan’s work on humanitarian intervention. His first speech to the General Assembly was not particularly well received due to the controversial idea that he introduced, but we have a beautiful letter from the Canadian Ambassador to the UN which helps us understand the controversy. The Ambassador writes that Canada would like to support the Secretary-General by initiating a study on the issue, and that was the birth of the Responsibility to Protect. It’s amazing that we’ve been able to discover the seeds of these key initiatives, and track their development—and it certainly has helped inform our selection process. What were some of your greatest technical challenges, and what did you learn from them? This was the first time that an outsider to the United Nations had attempted a project on this level. It required me to develop new types of legal agreements with the UN and learn to work within their security parameters, and it was a new process for them too. Our next steps weren’t always intuitive and could be subject to change. In one instance, the UN initially intended to give us the hard copies of the Kofi Annan papers, but later decided to scan them and send us the digital copies. The declassification process also added another layer of legal procedure, which delayed our work on the Kofi Annan papers. These early inefficiencies helped us plan a much smoother process for the Ban Ki-moon papers. Now, the documents are already digitized and our declassification officer is working on them, so that they will be delivered all at once as a fully declassified set. I’ve also been working more closely with the UN digitization team to improve the digitization process. The Kofi Annan papers took months to just sort through because the UN had not yet adopted a file-naming convention for their internal digitization process—each document filename was a scramble of numbers, and we had to rename each and every one with a date and a topic so that we could easily search through them. Now, the UN has included file-naming in their internal digitization process so that the files are delivered in clear chronological order. In midst of file-naming drudgery, you encountered an interesting digital humanities problem. How did this affect the way you organized information for the general public in the books and online? When we were deciding between the digital and book formats people said, “Why are you doing a book? Just put it online.” Many parts of the world don’t have access to the internet, but they have a library. My grant for the Kofi Annan papers ensured that I received 100 printed sets of books; I gave them to all of the African countries, and I would really like to do that again. I think it’s important to make these documents accessible in both print and digital formats, and to organize them effectively. The fact that we’ve developed a chronological and thematic organization scheme means that looking through the papers really gives you a sense of how much a Secretary-General does in a single week. You see the timeline of cause and effect. In the book, there’s a huge subject index at the end— if you want to find documents related to human rights, you still have to search through hundreds of pages about human rights. Online, you could type “human rights, Kosovo,” for example, and those documents would immediately come up. Either way, we’re considering the many different paths someone might take to find information on a certain topic – or even what the experience would be to browse through the documents, and discover something new and unexpected. As you begin this entire process for the second time, to what extent do you regard your new project with the Ban Ki-moon papers as a continuation of the Kofi Annan papers? How does this new project feel distinct? For one thing, I do see continuity in our archival and scholarly process. We want this work to continue. Even if I’m not the one to handle António Gutteres’ papers, I want to make sure the whole process is well established and clear so the next person can easily step in. It’s important for the UN to not only have institutional memory of its political history, but to enshrine it in an archival process to ensure these stories aren’t lost. Prior to these projects, the preservation of Secretary-General papers was so haphazard and ad hoc that many Secretaries-Generals even took their papers home — as was the case with Kurt Waldheim, whose papers are largely missing. I think students, scholars, and even the general public, need to have this information. They should understand what went wrong during each administration to gain the foresight to build on to each successive administration, instead of reinventing the wheel. Tell me about this narrative that emerges. What sorts of larger stories are you able to see about the role of the Secretary-General and also about the UN as an institution? SG Ban Ki-moon and SG Kofi Annan were quite different—as a comparison of their respective papers will attest, different issues were brought to the fore during their administrations. However, each leader’s public image and legacy will always be viewed relationally due to their chronological juxtaposition; records of their distinct leadership and negotiation styles, for example, can be viewed individually or comparatively. Every Secretary-General is different. They have different personalities, and they approach the job in different ways depending on their philosophy of what the job is. SG Kofi Annan saw it as a bully pulpit. If he was promoting human rights, he would make speeches, go on talk shows, meet the press, and talk about the importance of human rights. On the other hand, SG Ban Ki-moon saw his role as behind the scenes and low profile. With SG Ban Ki-moon, who wasn’t as publicly communicative about his work, the challenge is to reveal his amazing achievements and show his legacy in fulfilling the good offices of the Secretary-General. Secretary-General Ban Ki-moon traveled frequently—when there was a devastating typhoon in Myanmar and the leadership did not want anybody to come in and help, SG Ban Ki-moon went there. He met with leaders, and discovered that they were wary of ships floating offshore and feared invasion. When he understood the concerns of other intervening governments, he was able to open the door for NGOs to enter Myanmar with humanitarian aid—food, water, clothing, everything—and nobody knows that. What else will guide you in choosing what to include in the Ban Ki-moon papers? This project helps keep each Secretary-General’s signature issues alive, and draws them into conversation with the world today. The point is to make the papers accessible to the public because there is tremendous value in this work for everyone, and not just the UN—it provides a way for us to understand what’s going on in the world. In resolving the protracted Syrian conflict, it would prove beneficial to study the Secretary-General’s papers. If we understand the peacekeeping and negotiation tactics employed during SG Ban Ki-moon’s tenure—the number of times he met with certain officials, his strategy for bringing parties together, the rhetoric he used and the issues he discussed—we can refine our current strategies. This history is important not just as history, but as a tool we can use to help work towards peace in Syria and seek peaceful solutions elsewhere. In an ideal world, who do you want to see using these tools? Who will benefit the most? I’m a teacher, and I teach these things to my students . . . I look at them, and I say “you’re the next generation.” If you get them excited about it, they will carry our world forward, even if it’s just applying general knowledge so they can vote as informed citizens. This is a tool for young people to get involved. I’m also going to design projects for students that will allow them to take an issue such as climate change, and create a storyline. Scholars and academics will also have access to these new primary sources. And of course, the UN itself and UN staff who make these sorts of decisions every day will benefit. Staff come and go. Ambassadors come and go. But now, the United Nations will have a preserved institutional memory, and each successive designated actor within the UN will have these tools to inform their work. What kinds of lessons can other organizations learn about effective record-keeping? I think record-keeping is very important because it’s in the original documents that you see the struggle. For example, at one point SG Kofi Annan was writing policy on humanitarian behavior in peacekeeping with the International Committee of the Red Cross. They had written guidelines, which had gone through various versions, and the Department of Legal Affairs told the Secretary-General that the General Assembly was asking to see the guidelines before they were published. SG Kofi Annan was afraid the member states would water the guidelines down, so he decided to publish them before allowing the General Assembly to make comments. All of this back and forth is documented and it’s tense, but it’s the full story. I know that we’ll find similar internal struggles with the Ban Ki-moon papers. It’s really a philosophical matter if other institutions want to preserve their documents in this transparent way. My view is that people, not institutions, make decisions. People create institutions in the image of what they want to happen in the world, and each decision starts in the minds of a few individuals; therefore, we need to understand what those individuals were thinking, and how they interacted with others. To broadly address the value of this kind of record-keeping: I firmly believe that individually-held ideas shape institutions and policy. Preservation is so important. The original Kofi Annan papers live in the UN archives, but after we finished photocopying each document, we housed the duplicates in the Yale library and now we are placing them online. I like the redundancy because I get scared. Who knows what’s going to happen? The more you dig into the papers, the more you realize how precious these artifacts are. Absolutely, precious is a good word. 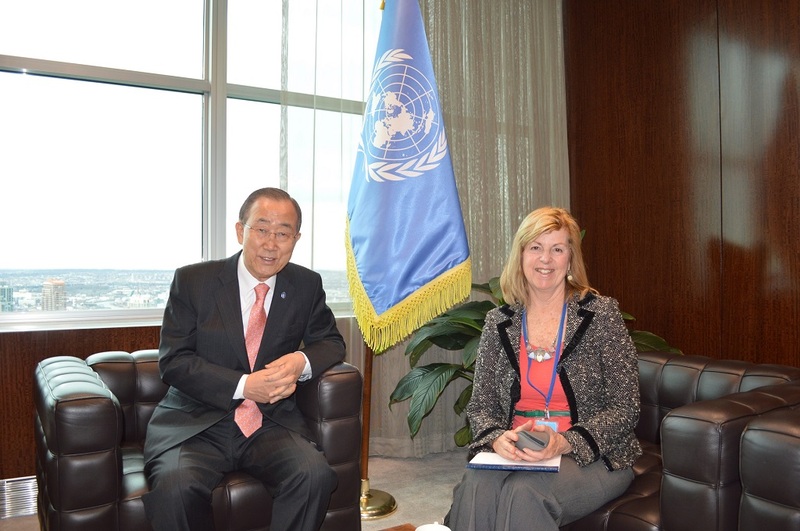 You can learn more about Professor Krasno’s work with the Ban Ki-moon papers here. No Replies to "Institutional Memory at the United Nations"